The helpful Priyank Garg has filed a Weather Report over at YSearchBlog. If you Yahoo Search you'll find 51 Priyank Garg results for YSearchBlog posts. This update came on Friday. Friday, again? My first impulse was that Yahoo was waiting until Fridays in order to spread the feedback flood over the weekend and to Monday. Then I thought it was simply that Yahoo would work the week to ensure the update was ready to go and announce it on Friday. There's also less searching over the weekend. But do Yahoo's Weather Reports show a Friday bias? 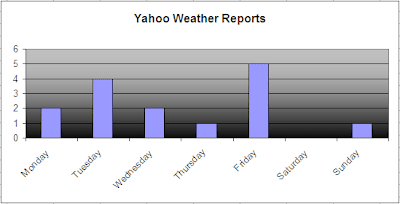 Only very slightly and only if you account the new Slurp announcement (Yahoo did, calling it a weather report). Google continues to tweak its SERPS too. The Air Force careers page which I pointed out was ranking 7th for [credit card] is... um... up to 5th!